Welcome to TeamSnap's Website Builder! Let's go on a quick journey in getting familiar with your website dashboard. First things first, you'll want to log into your site. Your login credentials should have been provided to you via an email from TeamSnap Sites, along with your new site's URL. 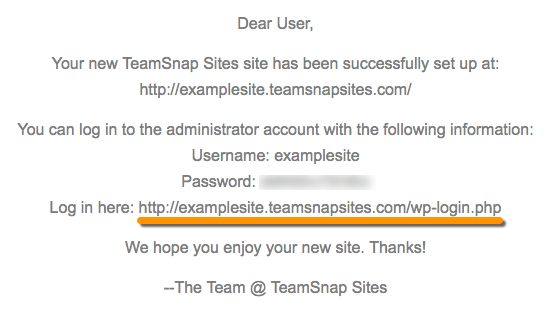 Once set up, you can log into your TeamSnap Website Builder site by adding /wp-login.php to the end of your site URL. If you set up a custom domain to use with your site you will use the new URL the same way. 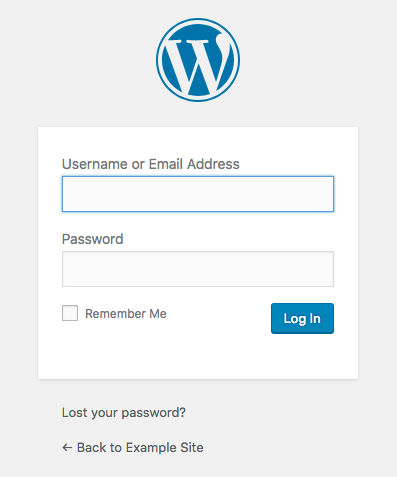 This will bring you to a login screen for your website where you can log in with your username and password. Once logged in, you will be taken to your dashboard. In the dashboard, you’ll find a getting started help section, new feature announcements, and a widget for refreshing the data synced from your TeamSnap account. Also, if you navigate to the Statistics section under Dashboard, you’ll see the data output from Google Analytics (if you have it set up). The dashboard is the screen you are taken to upon login and is the place you will find links to customize your site with posts, pages, plugins, etc. Posts are generally used for blogs, news, events and other more time-sensitive content. Pages are the screens people will navigate to within the site that contain more static information. They can be linked to your navigation menu items and are where you add permanent content sections with various layouts and content modules using Page Builder. So you've familiarized yourself with your new Website Builder site dashboard, now you need to get into the nitty-gritty of making it beautiful and filling it with your organization's content. This is the fun part! One of the first things you may notice is that your site is already set up with some default pages. There are two pages that you should leave untouched as far as modifying the layout/modules already set up. These are the Locations and the Schedule pages. They are special pages set up to connect to other links within modules that are connected to TeamSnap, and will dynamically update to display information based upon the link clicked. What does this mean? Well, for example if you set up a page for your division listing, each team in the division will display a link to view their schedule. They will be taken to the Schedule page, which will automatically show the schedule for whichever team they clicked, and if they go back and click a different team schedule link, it will automatically show that team's schedule instead. The Media section is where you'll upload any images, video, or other files that you will be using within your site. You'll just upload them once in the Media section and you can then select them for use throughout your site. Under the Appearance section, you will see subsections for Themes, Customize, Widgets, and Menu. Themes encompass the overall look and feel of your site including color, graphics, and text. There nothing you will need to edit in your Website Builder theme since that is preset by using the TeamSnap product. Under Customize you will see a whole menu of settings you can adjust within your site theme. Widgets allow you to add a variety of information to your theme's sidebar content. You can add a widget to display blog post categories, archives, or recent comments. This is where you can manage your site's navigation menu options and create your parent menu with sub-navigation to the pages, categories, and custom links that you set up. TeamSnap reviews each plugin made available within your Website Builder site for security. The plugins you see available have passed this vetting process. Plugins provide a variety of added functionality within your site without requiring special coding knowledge and need only minimal setup. Learn how to activate plugins . As the site administrator, you will have the ability to set up additional users within the site. This is separate from the user list within TeamSnap, meaning that the access level granted within your Website Builder site does not carry over to the same user within TeamSnap, and vice versa. Learn more about user roles and how to add them. The Tools section provides options for managing blog content that is mostly ignored for Website Builder purposes. The main area you need to pay attention to is the Domain Mapping option. This is where you will go to add your custom domain if you decide to obtain one as the last step of your custom domain activation. This is where you'll control some basic settings on your site like the Site Title & Tagline, set your time zone, URL format, define the homepage, etc.